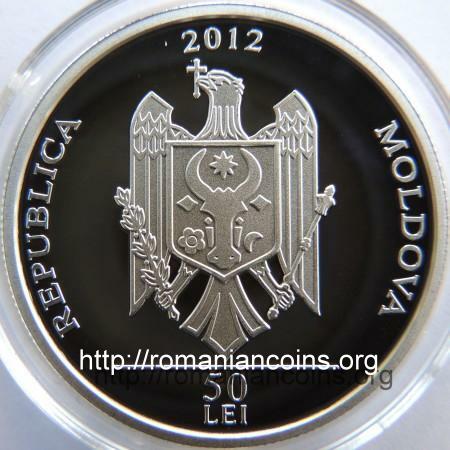 year 2012, circular inscription REPUBLICA MOLDOVA meaning "REPUBLIC OF MOLDAVIA" and the coat of arms of the Republic of Moldavia, in exergue horizontal line and denomination "50 LEI" Moldavian shepherd playing flute (wearing sheepskin hat, straight shirt, homespun peasant trousers and opanci - peasant leather sandals), Mioriţa the sheep, a stylized representation of the Sun, wavy line representing the mountains and hills of Moldavia, inscription "MIORIŢA" meaning "LITTLE EWE"
The coins belong to the Holidays, culture, traditions series. 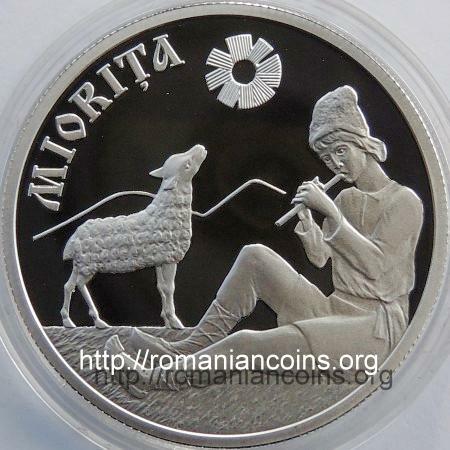 Until today (January 2013) the series Holidays, culture, traditions comprises the following 50 lei silver coins: pottery in 2007, cooperage in 2008, weaving in 2009, traditional musical instruments in 2010, carroling - colindul in 2011, Sînzienele and Mioriţa ballad in 2012. To the same series belongs a nickel plated brass coin - 10 lei 2003 - Celebration of the Wine. Mioriţa [Little Ewe] was discovered by Alecu Russo in Vrancea, during his exile at Soveja in 1846. It was published first by Vasile Alecsandri in 1852. The Alecsandri version (who might have "straightened" here and there some verses) is considered a masterpiece . Since then the folklorists have discovered over a thousand variants of Mioriţa all over the Romanian space. The ballad has aroused and still arouses a very important interest and is evermore interpreted over and over again. The first two verses of the poem Mioriţa are inscribed on all banknotes issued by the Republic of Moldova over to the present (2013). In the 1st century AD Greek rhetorician Heraclitus Homericus wrote several commentaries on Homer. A particular fragment is of peculiar interest: "Since the earliest age, to the naive mind of the child who begins his studies Homer is given as a nanny: we can say, almost, that since cradle our minds suckle on the milk of his verses. We grow, always having him aside...” . Similarly, the Romanians get firstly in contact with their folklore through ballad Mioriţa and built their national conscience on the perfection of its verses. 2. Flacelière R., Viaţa de toate zilele în Grecia secolului lui Pericle. Editura Eminescu, Bucureşti, 1976.